Second Alliance is a transformative work set in the Inuyasha universe. 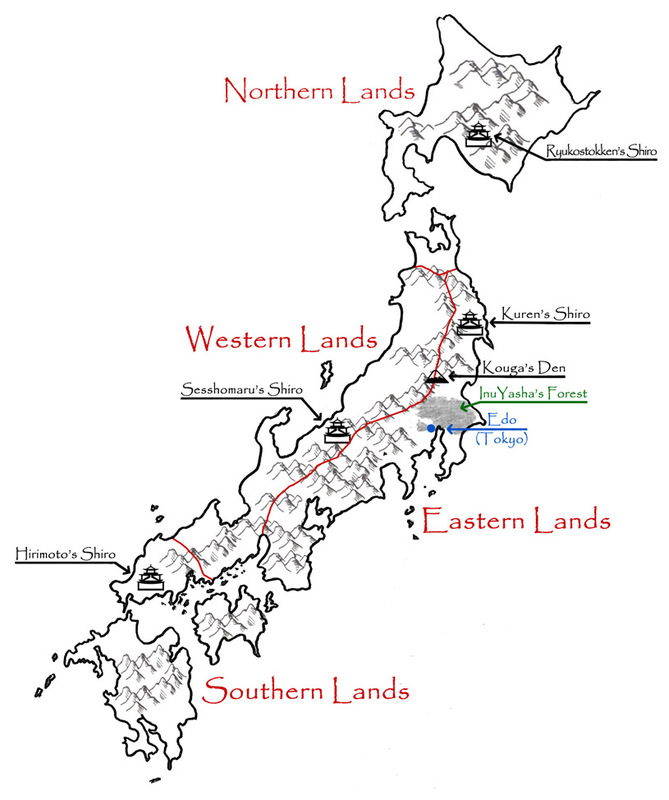 The image below is a map representative of feudal Japan as written in Second Alliance. Click for a larger image. The characters and universe represented here are wholly the creations of Rumiko Takahashi. This is a derivative work based on Ms. Takahasi’s original work, but has not been commissioned or approved in any way by Ms. Takahasi. Susan does not profit in any way from this work, and considers Second Alliance to be a fair use, transformative creative work as it adds new meaning and messages to the original work. She encourages readers who enjoy this work to purchase media created by Ms. Takahashi in order to be further immersed in the Inuyasha universe and support the creative endeavors of Ms. Takahasi. Should Ms. Takahasi or her estate take exception to the work presented here, Susan will remove the work upon notification by an official representative of Ms. Takahasi. Great story I can’t wait to see how things will be with Shippo when they come back. Ohh this is soo good!! Definitely one of the best fanfic’s I’ve ever read!! Cant wait to see what happens in the future with this story! I hope we get to see Sesshomaru again I love the awkward brother moments! Love Second Alliance- very well written and great content! I’m eagerly awaiting the next chapter! I’ve been following your story for quite some time and I can’t wait to read the next chapter. I think it will be a year since the last update in a few months. I’m hoping you’re still going to continue writing this fanfic? I have the Dokuga page saved as a tab on my phone that I keep checking to make sure that I don’t miss any updates! Will you be finishing Second Alliance on this website and not Dokuga or fanfiction.net? So I know to keep a closer eye on this page instead of those. Thanks you so much for being a truly amazing author. Thank you so much for releasing another chapter! I’ve been telling my friends about it and one of them even remembered me talking about it when I first started reading it a few years ago. I decided to read it over again because that’s what I usually do with my favorite books. I found myself lost all over again in the story and staying up late reading as much as I could before sleep came. I was pleasantly surprised and ecstatic when I got a notification that a new chapter was released. I thought it was a coincidence that I commented a little before your chapter released and I never imagined that you would see and reply to my comment since I know that life is busy sometimes but I just want to say thank you. Thank you for continuing and thank you for writing your stories. Renoir, I can’t thank you enough for your comment in July of this year. Your enthusiasm for Second Alliance urged me to get back to it and start writing again. It is readers like you that are responsible for the final chapter being posted today. Please know, I wouldn’t have done it without you. Thank you for such a heartfelt response. I never thought a favorite author of mine would be possible to contact and get a response from. You are such a great writer and I will not forget how your words continue to move me. The best thing about a story is getting lost in it and you do that for me. This means a lot that you’ve acknowledged me as a fan and I’m really grateful that you have continued your writing. I can’t wait to see what other creative endeavors you have in store for us. Please keep on writing and remember there are people out there who look for your name when searching for more to read and get lost in. Wonderful work Imani! I’m still keeping up and these last chapters have been great! The recent one left a smile on my face. Thank you for taking the time and care to continuing this story. Absolutely adore Second Alliance! I enjoyed your other works as well, although this one remains my favorite. I look forward to your next update! Authors like you give me life (especially when forced to endure mediocre moments and survive through daydreaming)!